Northrop Grumman Corp. announced its participation in three Phoenix, Arizona-area conventions focused on microwave and semiconductor technology. Northrop Grumman's APG-83 SABR was competitively selected by Lockheed Martin for the F-16 radar modernization program to support U.S. and Taiwan Air Force F-16 upgrade programs. Within 16 months of the contract award, the company successfully completed all design reviews and delivered the first engineering, manufacturing and development (EMD) radar to Lockheed Martin. The steady production of the fourth Advanced Extremely High Frequency (AEHF) protected military communications satellite continues on track with Northrop Grumman Corp.'s delivery of the fourth payload to AEHF prime contractor Lockheed Martin 4 1/2 months early. A pioneer in the design and fabrication of advanced semiconductors, Northrop Grumman Corp. has introduced two new high power gallium nitride (GaN) monolithic microwave integrated circuit (MMIC) power amplifiers for Ka-band satellite communication terminals and point-to-point digital communication links. Northrop Grumman Corp., a designer and fabricator of advanced semiconductors, has developed two high performance Monolithic Microwave Integrated Circuit (MMIC) broadband ultra low noise amplifiers (LNA) that are in production for immediate delivery. The U.S. Marine Corps has selected Northrop Grumman Corp. to provide electronic jamming backpack systems to counter the threat of roadside improvised explosive devices (IEDs). 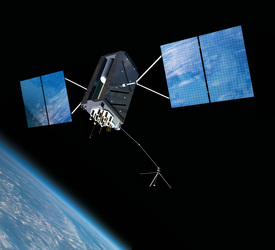 Continuing its support for the U.S. Air Force's Global Positioning System (GPS), Northrop Grumman Corp. has delivered 32 self-deploying, monopole JIB antennas for the third, fourth, fifth and sixth GPS III satellites.